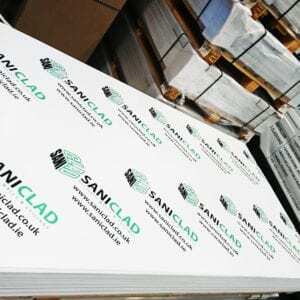 Our white SaniShield Hygienic Wall Cladding Range is undoubtedly one of the best value systems on the market, Saniclad is now specified by some of the biggest Restaurant/Pub chains in the UK so rest assured our products are fit for purpose. Available in 1.5mm, 2mm, 2.5mm. Class 0-1 fire rated. Sheet Length: 2.44mt, 2.75mt & 3.05mt. Look out for our trade pallet offers. By far the most popular hygienic wall cladding sheet, Saniclad’s 2.5mm hygienic wall cladding offers a wipe-clean finish and hides most substrate imperfections. Specified by Architects and Quantity Surveyors throughout the UK and favoured by our hygienic wall cladding installation teams, this is a widely recognised premium alternative to Altro Whiterock. Ideal for those who require a smooth surface and robust protection against a less than perfect substrate, this comes in three lengths – 8ft (2440mm), 9ft (2750mm) and 10ft (3050mm) all by 4ft (1220mm) wide. Flexible enough to be thermoformed (heated folded) around angles and edges to give that ‘wrap around’ look, this is the number one choice for our installation teams. This hygienic wall cladding sheet is routinely specified for national restaurant chains, bars, schools and coffee shops and we have completed over 2500 projects using this high quality wall cladding sheet. 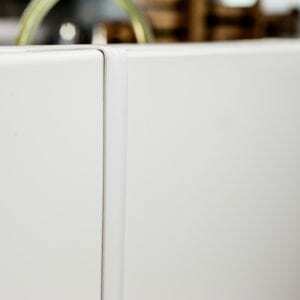 A popular sheet, our 2mm hygienic wall cladding offers a wipe-clean finish and hides minor substrate imperfections. This PVC cladding sheet is ideal for refurbishments when looking to cover slightly less than perfect substrate. Frequently chosen to be thermoformed (heat folded) around corners, this is can be neatly fitted around edges to give that ‘wrap around’ look. For those applications where newly plastered or very smooth walls just require a cost-effective, hygienic finish. 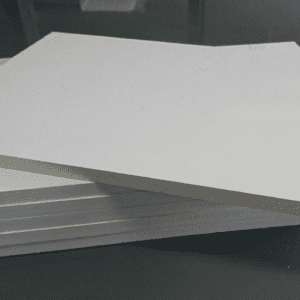 Our entry-level white 1.5mm hygienic wall cladding sheets offer a wipe-clean surface which hide surface blemishes in the substrate – please note this sheet is not designed to smooth out structural substrate imperfections, but just cover and seal off the substrate. Most suitable for new build walls, this hygienic wall cladding sheet is our entry-level option and is available for next working day delivery in 2440mm x 1220mm (8ft x 4ft) length. We can cut your PVC sheet into bespoke sizes, please note straight cuts only! Just send us your required cut measurements on completion of your order and leave the rest to us. Cutting charge is £6.50 per sheet. Estimated delivery 2-3 days.